The HECKLER&KOCH MP7-PDW is the NEW submachinegun from H&K. It's chambered for the innovative.4'6x30mm Penetrator Ammunition, looking like a "compact version" of the old 4'73x33 G11 Caseless Ammo. 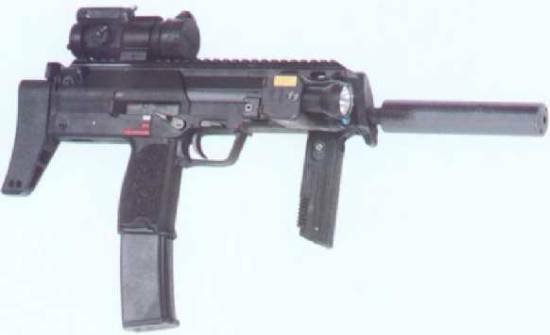 It was intended as a Personal Defense Weapon for Non-Combatant Army Personnel... but ALSO THE FN P90 was. Just as the FN P90, this weapon is going to became a special forces offensive weapon (well... maybe is going to REPLACE THE OFFENSIVE HANDGUNS, because this weapon is REALLY TOO SMALL to be used as a primary weapon...). This very small SMG has a S-E-F trigger group, a collapsible stock, a folding foregrip and a rail on the upper side for STANAG optics. The fine folks at H&K GMBH of Germany have prepared a lot of optionals (red-dot optics, tactical lights and lasers, 40-rounds combat magazines instead of the "standard" 15-rounds, suppressors); This pic features an H&K MP7-PDW provided with ALL options, a special "stocking" for special troops such as SEAL teams and others.